(This piece first ran in May of 2014. It's a great reminder for those of us who are wrangling little ones on Sunday morning and possibly focusing on the wrong goal). A little over a year ago I posted the following on Facebook: “I totally get the challenge of keeping kids quiet in church, but letting your kids play Angry Birds on silent mode on your phone rubs me the wrong way.” There followed a lively discussion on said topic, with some excellent points made all around. It got me thinking about kids in church, and I realized I’d been asking the wrong question all along. I had been asking, “How can I keep my kids quiet in church?” when I should have been asking, “How can I teach my children what church is?” We don’t bring our children to church to “keep them quiet.” We bring them there to hear God’s Word and receive His blessings. If they’re quiet in the process, that’s wonderful, but that shouldn’t be our ultimate goal. When our oldest was a baby, I had a bag full of tricks for every church service. I had Cheerios to stuff in his mouth the second he started squawking, a sippy cup to keep him occupied, and books and quiet activities galore. Frankly, I missed a goodly portion of the service because I was so concerned about keeping him quiet. But then a curious thing happened. We had another baby, and as he got older, so did our oldest. Suddenly I realized that the oldest, now 3, was old enough to not need Cheerios or books. I wanted him to be participating as best he could. He could stand when we stood, fold his hands when we prayed, even recite the Lord’s Prayer with us. But he wasn’t. He was trying to snitch Cheerios from his younger brother or sneak books out of the diaper bag. Something had to change. That marked a turning point for me. I realized that to get kids to behave in church I had to show them why we were there in the first place. And the sooner they learned that lesson, the better. I didn’t want them to associate church with quiet play time. I wanted them to remember what we do in church. We sing hymns. We pray. We listen to God’s Word read and proclaimed. We go up to the communion rail together. We aren’t there to color or read other books or play Angry Birds or even stuff Cheerios into our mouths. So what can be done? First, discuss with your husband a plan of action. The more children you have, and the younger they are, the more of a challenge worship will be. So have a plan. My own case is rather unique in that for the first 8 years or so, I was often the only parent in the pew with our kids. Now that I am the organist, the tide has turned. My mother sits with my husband to help with the four kids. If at all possible, especially with younger children, have a helper. (Hint- your husband can be that helper!) Babies and toddlers generally require more attention than an 8-year old. And let’s face it, a 22-month old isn’t going to sit there and listen to the Scripture readings quietly. I hear my 22-month old throughout the service, and if she gets too loud my mother takes her to the cry room- not to play, mind you, but to the cry room pews where her noise isn’t too distracting to other worshippers. When is a child “too distracting?” In general, my daughter isn’t so bad. She’s vocal, yes, but it’s usually excited chatter on her part. “Mommy!” she cries when she sees me. “Jesus!” she yells when she sees the cross. “Doggie!” she protests when she drops her stuffed dog. Are these things overly distracting? I don’t believe so. If she starts yelling them over and over, then sure, time to leave. But don’t let them off the hook that easily. If you take them out at the first outburst they will quickly learn to manipulate you. Keep them in the sanctuary with everyone else if at all possible. With our 22-month old, we do allow her a sippy cup and her doggie. But we’ve found that if we allow books and other things to distract her, they provide more of a distraction for our older children than for her! Be cautious when allowing distractions in church, because that’s exactly what they do- distract from the reason we’re there in the first place. What about preschoolers? If possible, have a preschooler sit on your lap for worship. Show them where you are in the bulletin or hymnal, help them stand and sit with everyone else, and encourage them to recite the Lord’s Prayer and the Creed with the congregation. Preschoolers can also pick up rather quickly the words we speak during Confession. If your church does the same liturgy on a regular basis, preschoolers also memorize these words and canticles easily. Even before children can read and follow along on their own, they can participate if they have memorized certain parts of the service. Before each reading, whisper to your preschooler a little summary of what will be read so he or she knows what to listen for. Or make it a “game,” for lack of a better word. “Okay, sweetie, in this reading Jesus is going to do a miracle. Listen carefully and tell me what it is afterward.” Kids love that kind of thing. The whole point is to get them involved in the service from a young age. A child who is learning to read can follow along as you point with your finger to the words in the hymnal or bulletin. It makes them feel important once they can actually participate like the adults. And once a child can read and follow along on his or her own, the expectation should be that they do so with the entire service. They can find the hymns on their own, read the readings if they’re printed out in the bulletin, and listen during the sermon. We recently bought our 8-year old his very own hymnal with his name engraved on it. He now takes it to church with him and is as proud as anything to use it. Consider giving an engraved Bible or hymnal as a gift once your children reach a certain age or can follow along completely on their own in church. It’s also important to consider where you sit in church. Most families with young children sit in the back so they can take the kids out if they need to. That’s what we have always done, honestly. But as my older kids get older, I’m seeing the benefit of having them sit at the front of church. There were a few evening services during Lent that only our older boys attended, and they were allowed to sit in the front of church. Their behavior there was far superior to their behavior when they sat toward the back. In the back they can see other kids and often get sucked into goofing off with them or making faces to get a laugh. Sitting at the front removes such distractions. Mull it over and see if you can’t step it up a few pews. And what about bathroom breaks for older kids? “Mom, I really have to go to the bathroom!” your second-grader whispers. And while that may be true, chances are if you let him go, he’ll be out for 10 minutes, taking his jolly old time, getting a drink, etc. So our policy is this: if you have to go to the bathroom or blow your nose or whatever, fine. But then you have to re-copy what you miss while you’re out. If you miss an entire 8 verse hymn, you can copy it after church. If you miss the reading of the Samaritan woman at the well, no problem. You can copy those 45 verses later. I’m telling you, this seriously works. The first Sunday we tried this, our 8-year old absolutely had to use the restroom and so left during the offering. After church he worriedly asked me, “Do I have to copy the music you played during the offering?” (I didn’t make him do that, FYI. The offering is a “safe” time for them to leave if necessary.) But honestly, that completely took care of the bathroom issue during church. 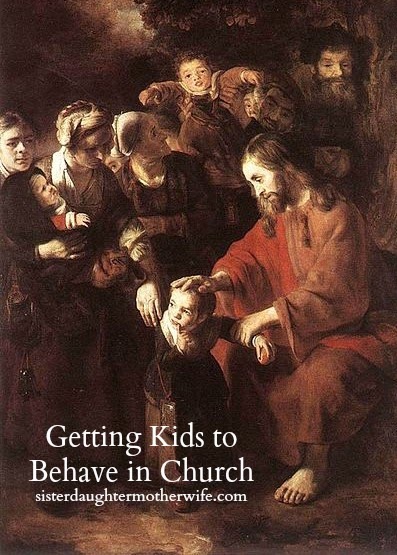 Basically the whole issue of getting kids to behave in church boils down to this: From the very beginning, teach them why they are there in the first place. Remove as many distractions as you can. Model how to behave in church. Expect them to do the same. Children will live up or down to your expectations. If your expectations are so low that you only think they’ll behave when playing Angry Birds on silent mode, they’ll happily comply. But if you expect participation from them and model reverent behavior on your own part as well, they will learn to live up to that expectation. Remember, the Holy Spirit works faith in the hearts of children of all ages. Don’t let others tell you that kids can’t get anything out of church. That’s a lie. From my 10-year old who can sing half of “Jesus Christ is Risen Today” for memory down to my 22-month old who sees the cross and shouts “Jesus!” the Holy Spirit is actively at work in their hearts, as He is in yours and mine. “Let the little children come to me,” Jesus says, “and do not hinder them, for the Kingdom of God belongs to such as these” (Mark 10:14, italics mine). Amen. I have a question for you and am hoping you can help advise me. My husband is a pastor, which means I am left to mind our two girls (ages 2.5 and 16 months) in the pew on Sunday. This has been such a struggle for me and I do rely on cheerios and books in order to maintain some semblance of control. I dislike taking them to the nursery because I don't want them to think of church as a time to play with toys. Truth be told, I don't want them to even eat or rely on books to get through the service. I have received little help from members of the congregation, have no family or friends where we live, and feel alone and lost in dealing with this situation. What can I do? Thank you. Mary, that sounds tough! Those ages, with no bigger kids to set the example, are a challenge. Do you think that someone in the congregation would help if you specifically asked? I.e., "I'm finding two kids a challenge on my own--would you be willing to sit with us and let the 2.5-year-old sit in your lap if I have to take the baby out?" or, "Would you be willing to sit with us and block the aisle?" Or whatever you're looking for? I know that if I was an older women in a congregation, I would be happy to help a young mom, but would probably feel intimidated about offering. I'd be afraid it might be taken as an implication that she wasn't doing the job well enough. Hi, Mary! Thanks for your honesty in sharing your situation. Ironically, my own situation has changed since I wrote this article two years ago. 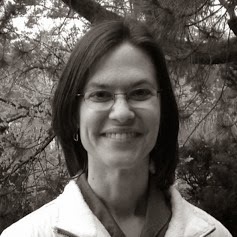 My husband is a pastor and thus I am single-momming it in the pews with our kids- now five of them, rather than the four I had when I wrote this. Nor are we near my family anymore, so I understand a bit of your frustrations about feeling alone in church. The ages of your children are particularly difficult for managing in church, especially when you're on your own. When my oldest two were about that old, I remember coming home in tears a few times, convinced that it would be better for me to skip church and break the 3rd commandment rather than spend the entire service angry with my children and breaking the 5th commandment against them in my mind! As Anna suggests, I think it's a good idea to directly ask someone for help in church. Many people truly are willing to do so, but fear they'll overstep their bounds if they offer without being asked. I have a few members I feel comfortable enough asking if we can sit with them so if I have to take my 19-month-old out, the rest of my kids can stay in church under supervision. Perhaps there is even a high schooler who would be willing to sit with you and hold one of your children in their lap. Young children often look up to older kids and may mimic their behavior in church. We have a senior boy in our congregation who plays football. My four-year-old adores him. I sometimes sit in front of his family so if she acts up I can whisper, "See how nicely Nathanael is listening? I bet you could listen that well, too." And it works! Not every time, mind you, but she does tend to shape up when she thinks he might be watching her. Honestly, I've also found that sometimes my kids behave better for others than for me in church. Perhaps you could ask an older member or an older couple, "Mind if we sit with you today?" Sometimes just the presence of another adult in the pew is enough to encourage younger children to behave. And perhaps you can forge some surprising friendships that way too! One thought regarding the Cheerios- perhaps you could make it interactive with your 2 1/2-year-old. Say, "Listen for when Daddy reads about Moses today. When you hear it, squeeze my hand and you can have a Cheerio." You can modify this as needed- a specific hymn or song, the choir anthem, the Lord's Prayer, etc, and you can use it multiple times throughout the service. God be with you as you continue to raise your children to know Him! This is a great post. Does anyone know of any other good books or resources on how to handle children in church? CPH has a book called "Parenting in the Pew", which has been out for a long time. It's what I used for ideas when I was a parent of my own two dear little noisemakers. Thanks for the suggestion, Elizabeth! It sounds like a great resource.